The dwarf shrimp hobby has been growing explosively over the past few years, and with good reason. These tiny critters might seem boring to some but their easy care, interesting behavior, and rapid reproduction make them a great choice for both beginners and more experienced aquarists looking for a new breeding project. No large tank needed and things will never get boring, as new color varieties are constantly being developed. If you want to try your own hand at breeding dwarf shrimp, look no further! Keep reading for everything you need to know about setting up a shrimp tank, ensuring your shrimp are healthy and turning shrimp into more shrimp. 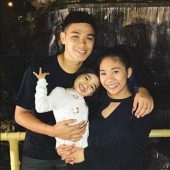 This article about breeding dwarf shrimp is a guest post by Mari from Aquariadise.com! The first thing you need to think about if you’re considering setting up your first breeding tank is that not all dwarf shrimp are alike. “Dwarf shrimp” is a broad term for multiple shrimp species in the Neocaridina and Caridina genus. Some popular dwarf shrimp varieties are cherry shrimp, rili shrimp, crystal red shrimp and tiger shrimp. These different species are alike in many ways but there are also a few differences. 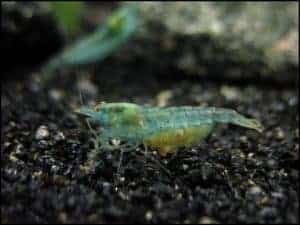 Bee shrimp from the Caridina genus (like crystal red shrimp) are usually considered more difficult to keep and breed than Neocaridina shrimp. Tiger shrimp are somewhere in between. When we say “difficult” we mean the shrimp require a more specific range of water values (which can result in having to use reverse osmosis water), are more sensitive to water fluctuations and reproduce less quickly. If you’re a beginner I recommend going for Neocaridinas. They are easy to care for and can handle the occasional beginner mistake. As an added bonus they come in many colors! Go for red, yellow, green, blue, white or even (partly) translucent. Read my guide on setting up a shrimp tank here. All animals need to be happy and healthy in order to breed succesfully and dwarf shrimp are no exception. As discussed above their specific needs can vary but the basics are the same for all species. To get started you need an aquarium of at least 5 gallons (preferably 10), filter, heater, liquid test kit, substrate and some decorations in the form of live plants and shrimp hides. That’s all! You can read more details on setting up a dwarf shrimp aquarium. Remember to always cycle your aquarium before adding shrimp. These tiny creatures are very fragile and the slightest amount of ammonia can easily be fatal for them. Check, check, and double check those water values! Once you’ve chosen your shrimp, set up a tank, and released your stock into their new environment it’s time to make sure they stay as healthy as possible. The most important aspects here are stability and diet. Shrimp are very sensitive to bad water quality and sudden fluctuations. This means your care routine should include regular water tests to make sure the water values are still where they’re supposed to be at. Ammonia and nitrites should always stay at zero while nitrates should be low (<10 is ideal). Perform weekly water changes, making sure to match the new water to the old both in temperature and water values. Also keep an eye on the temperature by checking the thermometer daily. Like many other bottom feeders dwarf shrimp are omnivores that will eat anything they come across. In the wild they feed mainly on biofilm, which grows on all surfaces. Aquariums usually don’t contain enough biofilm for an entire colony (they’re simply too clean) so it’s up to you to make sure your shrimp get enough food. Use a high quality shrimp food as a staple and add some variety with frozen foods like bloodworms and fresh blanched greens like peas. Feed once a day or so and be sure to remove any uneaten foods within a few hours. Try adding leaf litter like Indian almond leaves to provide a 24/7 snacking source and improve the overall health of your shrimp. So your water quality is high and your shrimp colony is well-fed and healthy. What now? Well, nothing, really! The great thing about dwarf shrimp breeding is that as long as your shrimp are healthy you can just let them do their thing. You don’t have to induce spawning will all kinds of rainy-season-imitating methods and baby dwarf shrimp don’t have to be raised in a separate setup. If there are males and females, there will be babies. The first sign that baby shrimp are on their way is when the females (which are larger and more brightly colored) become saddled. This means a yellow-greenish spot forms behind the head; the eggs are in here until they are fertilized. Once the female is ready she will move the eggs from the saddle to her swimmerettes (back legs), where they remain for around 30 days. She keeps the eggs healthy by waving water over them and removing any bad ones. You’ll know the eggs are almost ready to hatch when you start seeing little eyes inside of them. The fry are born as tiny copies of their parents. They usually spend their first few days in hiding, feeding on bio-film until they’ve grown a little. Once they’re ready you will start seeing them forage alongside the parents. The fry grow quickly and should color up within a few weeks. If you’re breeding for a specific color be sure to remove any fry that are “lower quality”; most shrimp breeders have a separate cull tank where these can happily live out their days. To conclude: breeding dwarf shrimp is easy and entertaining. It makes a fun project for all aquarists and you can even make a little money selling your shrimp to other hobbyists! Why not start your own shrimp breeding project now?